Dr. John Reagan demonstrates a typical CPR routine on a mannequin to show students how to properly perform CPR for his level two law class. “The most important thing is to recognize the emergency, and you want to make sure the scene is safe. Next, you want to check the victim to see if they are okay. Make sure you assist them [the victim] as quickly as you can to see what is going on, have one person call 911 while another person finds an AED. Then, look at the victim to make sure they are breathing. If they are not breathing, you have to start CPR,” Reagan said. Imagine this: you and your friend happen to attend your school’s basketball game when suddenly the star player collapses. Everybody freezes. What do you do? The idea of someone going into cardiac arrest and the responsibility of saving their life may sound terrifying and impossible, but in Dr. John Reagan’s second level law class, the CPR course guides students through the process. Performing CPR requires focus, accuracy, and determination—all qualities that Reagan teaches his students from the very beginning. “Cardiac arrest is a very real thing. There’s a good chance we may come across it at some time in our lives, and it’s really good for everyone to know CPR because we might make that difference at that moment for that person,” said Reagan. In order for students to receive CPR certification, students watch several videos by the American Heart Association, which guides students in step-by-step instructions to perform CPR. Students then practice on their own while Reagan assists them on any problems that occur. After completing the videos, students perform CPR in front of Reagan with a partner. Reagan uses a skills checklist created by the American Heart Association to grade the students’ practice. After completing the skills checklist, students take the written examination in order to prove their knowledge and understanding of performing CPR. After students complete these tests, they face eligibility to receive the certification card. “I feel very confident in my CPR skills. [Dr. Reagan] did a very good job at teaching us and even correcting our smallest mistakes, like where to place our hands. He was always there to help us,” junior Hope Anyanwu said. In Reagan’s law class, completing the CPR certification course differs from a typical CPR class at a hospital due to the number of students in Regan’s class. Typically, the CPR certification course lasts eight hours in one day. However, in Reagan’s class, the course stretches over a ten-day period since the course exists as part of the Cobb County School District’s curriculum. Throughout the course, Reagan hopes students gain knowledge for an actual life skill and not just a class grade. “The most important thing—and this is what I try to teach and reteach to the students—is if there’s a medical emergency, somebody has to take action. I want them to always feel comfortable that they can take the action,” Reagan said. 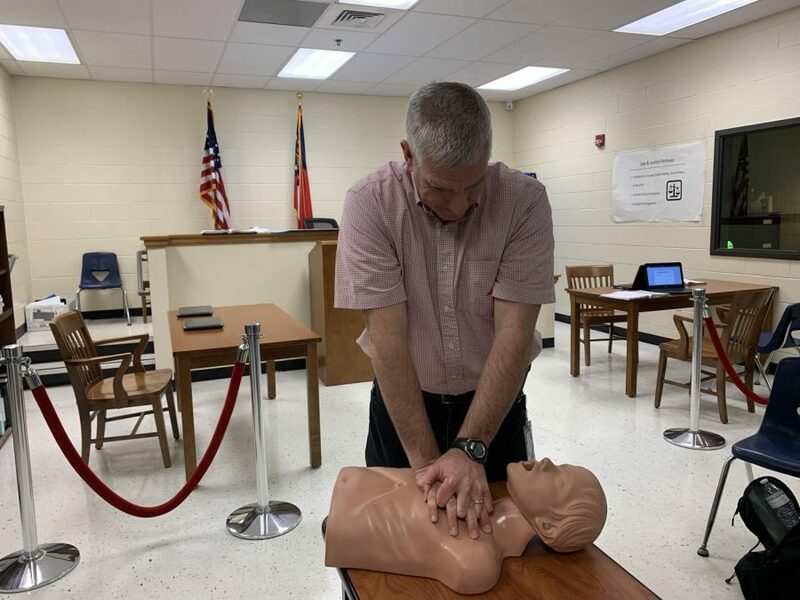 During the certification process, Reagan constantly reminds students of the importance of paying attention during the lesson because of the high possibility of performing CPR on a loved one. Throughout Reagan’s thirteen years of teaching at NC, he remembers one personal story from a previous student that positively changed his life forever. “There was a young man who was in his thirties and he was walking into a McDonald’s, and as soon as he walked into the door of McDonald’s, he went into cardiac arrest. A student that I had instructed and had taught CPR worked at the McDonalds and she sprang into action. She had somebody call 911 and she started to organize a team to do CPR. She knew the procedure, she knew what to do, and she brought other people to help— and the young man’s life was saved,” said Reagan. In regards to the students’ experience during the class, students believe the course benefits them more than any other course here at NC. “The CPR course is absolutely beneficial to me because it’s a useful life skill to have. You can save somebody’s life. It’s better than learning lessons that aren’t beneficial to us, like calculus,” junior Bryson Dubsky said. Reagan not only believes that CPR benefits everybody in his class, but he also considers the course superior to all other courses and hopes students will remember this lesson forever. 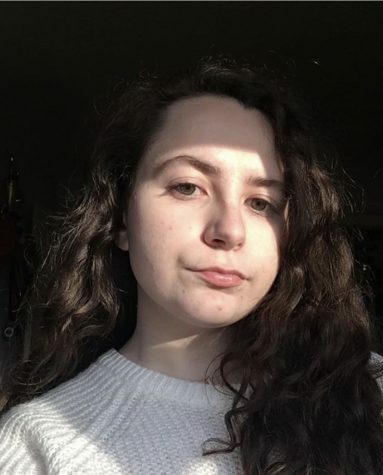 “There are many classes to take at NC, but this is the one class that if ever needed—and I hope not—but if [the students] had to participate in performing CPR, they would become a true hero. I like to think of this [as] the hero class,” Reagan said. With years of teaching under his belt, Reagan plans to continue guiding students through this course for the foreseeable future.